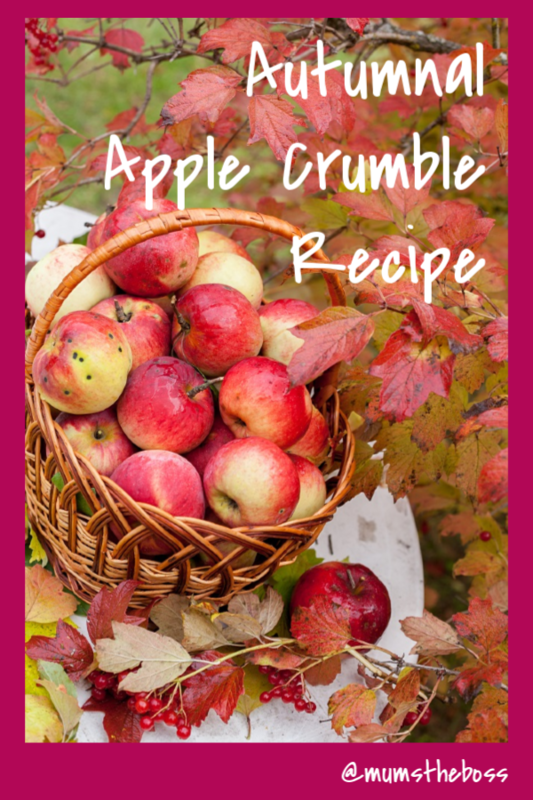 As summer gives way to autumn, I’m having a clearout of my blog, and I thought I would republish this apple crumble recipe as it is one of my favourites at this time of year. 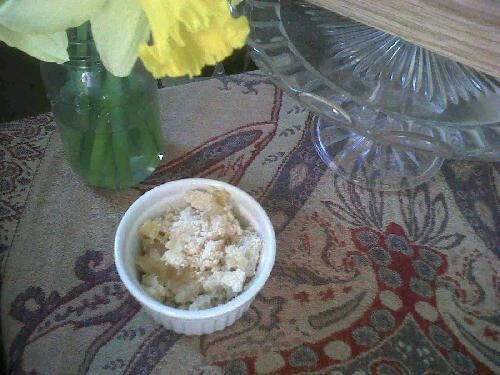 I love apple crumble, it’s so comforting and just the perfect easy pud to make for 1 person, or many. I’ve put a twist on a classic with star anise while keeping all the luscious softness and flavour of the apples that we all love so much. You want Bramley apples, which are a cooking apple that aren’t as sweet as eating apples and become a beautiful puree as they cook. This means a combination of soft soft apple and a slight crunch of crumble in the mouth that is just divine. 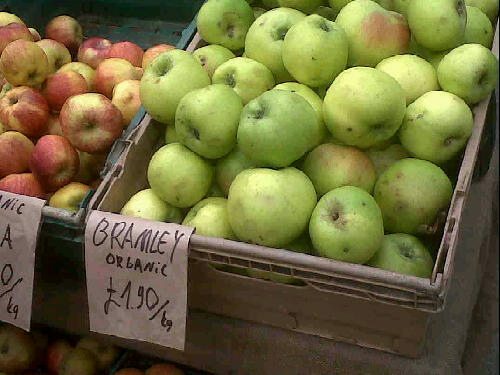 I bought the apples at my local farmer’s market, but Bramleys are on sale in most supermarkets at this time of year, or you may even know someone who has an apple tree. Preheat the oven to 180C/170C fan/Gas Mark 4/350F. Core and slice the apples. You can peel them (I prefer to leave the skins on as it adds a nice rustic element and keeps more vitamins in). If your apples aren’t organic, then it is best to peel them. Put into an ovenproof dish. Add the sugar to the apples (optional if using eating apples) and tuck the star anise into the middle. Top up with water to about an inch deep. If you are using conventional apples which tend to be dry, then you may need more water. A good tip – if your apples don’t start to get brown quite quickly after you cut them, then use more water. 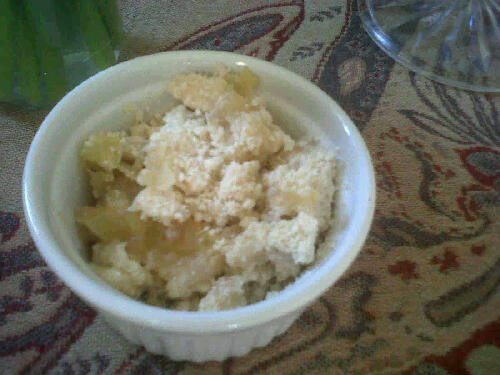 Make your crumble by rubbing the butter into the flour. I like a bit of brown sugar in my crumble so I added a tablespoon. Tip your crumble over the apples and smooth over the top. It’s best to have left over crumble mix than over fill. You can sprinkle any left over crumble mixture over fresh fruit then brown under a grill. Bake for around 40 minutes until it is bubbling and the top is golden. Ovens vary a lot so check through the glass door. It’s ok to open the door to check with a crumble (it isn’t with cakes!). Serve with ice cream or custard or with a chunk of mature cheddar. Do you have a favourite apple crumble recipe? What flavours do you use to jazz up your crumble? Tell me in the comments. This recipe was submitted by Rosie Slosek, who runs The Money Haven, supporting one man bands in the UK with hassle and fear-free accounts mentoring, with a home made brownie for every client. She is passionate about cake being an important part of self motivation. Start your week well and sign up for her free Accountability email every Monday morning at 8am. I’m partial to some custard.